Throughout the Whiteface Region, visitors will find hiking trails for all levels of ability from rugged mountain adventurers to trekking families looking for the next vertical adventure along bubbling mountain streams, cascading waterfalls, and ancient rocky formations. The High Peaks are beautiful, which means they're also extremely popular. Consider getting away from the crowds by tackling some of these lesser visited mountains. The views are just as nice! ​Before heading out, be sure to review Leave No Trace ethics to ensure you're protecting the Adirondacks for future generations! The DEC is a great resource for more outdoor recreation related information. Choose a Challenge that's right for you! Leftover from the melted glaciers that once carved out the valleys of the Adirondack Mountains, picturesque, refreshing ponds are present on many area hikes – the 4-mile trail leading to Owen, Copperas, and Winch Ponds is a local favorite. It features an easy grade hike and rewarding views of these striking bodies of water amidst a scenic mountain backdrop. Head over to the Wilmington Wild Trails Systems, providing over 3 miles of trails at a moderate difficulty level – if you reach the highest point the system has to offer, you'll find yourself overlooking the Whiteface region valley. If you seek a more challenging, but rewarding hike don't miss Whiteface Mountain, the 5th high peak of New York State. Offering several routes to the top - head in from Connery Pond or the Wilmington Trail and climb your way to the summit of this towering giant. On a clear day visitors can enjoy a view of Vermont's Green Mountains. Peruse the numerous Whiteface Region lodging options and book a basecamp for your fall hiking excursions. 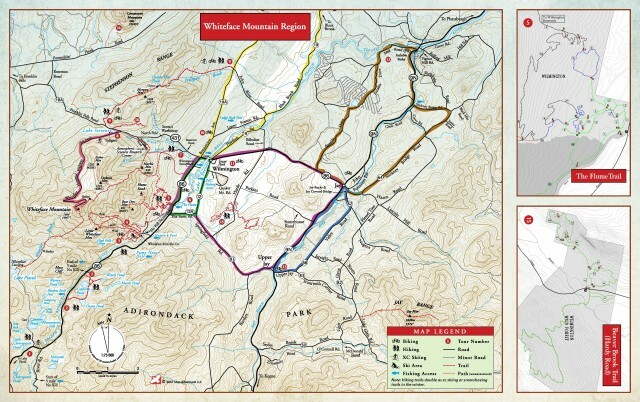 View our downloadable Outdoor Recreation Guide for trail information on hiking the high peaks region, printed copies are available at the Whiteface Mountain Regional Visitors Center and view a list of trails below. Follow the path to, and along, the Ausable River for an easy trip suitable for small children. The Monuments commemorate the 50th, and 100th Anniversary of the establishment of the Adirondack Park.